A more exact translation of the Russian title would be A Vityaz at a Fork in the road. 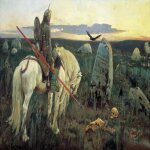 The painting is an illustration to a common motif of Russian folk fairy tales, when a hero comes to a fork in the road and sees a menhir with an inscription, kind of: "If you ride to the left, you will lose your horse, if you ride to the right, you will lose your head"
This work - a long history. 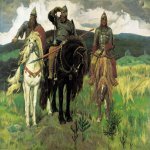 Bylina issue that began painting «The field of Igor Svyatoslavich's battle with the Polovtsy», has been further developed in a series of works, the main character who becomes the hero-knight. Pencil sketches and drawings for the painting began in the early 1870-ies. In 1877 Vasnetsov brothers Arkady writes sketch «Warrior in a helmet with kolchuzhka ». The plot is the painting came under the impression Bylina «Ilya Muromets and robbers».«... and reflect Muromets Ilya, Ilya Muromets son Ivanovichk, in which direction to go ...»(A more exact translation of the Russian title would be: «... AND razdumalsya Muromets old Ilya, Ilya Muromets, son Ivanovich, but that will dorozhenku ehati ...». These lines the ancient Russian Bylina were subject to the picture. In 1877 was finished with the first version of the picture (but not the last, there are two more complete picture of the same name). Vasnetsov exposes its copyright under the name "Knight" at the 6 mobile exhibitions in 1878. Then he came into Peredvizhniki. Peredvizhniki (Russian: Передвижники; pronounced as Pear-rad-veech-niki), often called The Wanderers or The Itinerants in English, were a group of Russian realist artists who in protest at academic restrictions formed an artists' cooperative which evolved into the Society for Traveling Art Exhibitions in 1870.The society formed in 1870 in St. Petersburg under Ivan Kramskoi, Grigoriy Myasoyedov, Nikolai Ge and Vasily Perov's initiative during a struggle of the avant-garde art forces of the country for democratic ideals, and in a counterbalance to the official center of art—the St.Petersburg Academy of Arts. The society developed the best traditions of the Artel of Artists headed by Kramskoi, who became the leader of the new association. 1871 to 1923 the society arranged 48 mobile exhibitions in St.Petersburg and Moscow, after which they were shown in Kiev, Kharkov, Kazan, Orel, Riga, Odessa and other cities. Cloth earned the endorsement of the critic B. Stasov, but the artist is not satisfied. During four years Vasnetsov has continued to work on different versions of the painting to finish the main one in 1882. The final "canonical" version was written in 1882 for Savva Ivanovich Mamontov - famous Russian businessman and philanthropist. 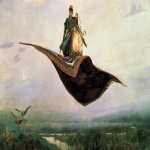 By the time he had already bought the painting Vasnetsova "Flying Carpet" and "Fight of Scythians and Slavs". In the initial sketches Knight was turned toward the viewer. The latest version has increased the size of the canvas, flattened composition, was a monumental figure Vityaz. Now we do not see the person Vitiaz, the artist more important to focus on the inscription. The inscription on the stone corresponds Bylina texts, but not fully visible. «If you go straight - die - do not pass either walk or drive or fly». «Followed further inscription:« the right to go - to be married, left to go - to be rich »- on the stone is not visible, I hid them under the moss and erased part», - explained in a letter to Vasnetsov Stasov who took part in the hot work on the picture. Thus, the attention of the viewer is drawn to the dark prophecy, and it becomes clear that the Vityaz no other way, only that, disastrous. And if we look closely, we see that the heroes ... no there is no way! In the initial versions of the painting was a road, but Vasnetsov remove it in version 1882 for more emotion, that there was no other option but indicated on the stone. 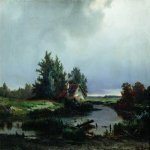 The pictures painted in oil on canvas. Version 1882 is stored at the State Russian Museum. Version 1878 is stored in Serpukhpvsko Historical and Art Museum. Plot «A Knight at the Crossroads» reproduced on artist's gravestone at the cemetery Vvedensky.